Secure Airparks are the only park and ride service to be able to drop off and pick up at the front of the terminal. Secure Airparks has been in the car parking business at Edinburgh for over 15 years. They have built up a good reputation and relationship with our customers and continue to offer high standards and quality of service.Secure Airparks offers short term and long term parking for Business & Holiday passengers at Edinburgh Airport. With a state of the art ANPR system you are able to drive in, park your car and keep your keys. Once checked in, transfers take just 1 minute. You can now park up your own vehicle & take your car keys away with you meaning that no one else needs to move your vehicle. Because this product is available at such a cheap price, once you have made your booking, you can't change it, or cancel it and get a refund. 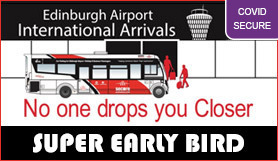 On barrier opening please go to nearest space and bus stop, where you will be picked up and taken to Airport. Take your keys with you. You will be dropped off and picked up at Stance /Stand H, which is in front of the airport at the International arrivals door. Buses run regularly every 5-10 minutes. If you have any queries please call the number on your confirmation and quote your order reference. Full instructions will be given to you on arrival to the car park. Pick up will be done from Stance / Stand H, which is right in front of the airport at the International Arrivals Door. From the M8, leave at junction 2 (towards the Newbridge Roundabout). Follow the road and you'll come to the Newbridge roundabout, merge onto the A8 Glasgow Road. From A8 Glasgow Road, keep going past Ingliston Road and take the slip road on the left. Shortly after, you'll come to a roundabout, take the second exit onto Eastfield Road. very quickly after, you'll see yet another roundabout, take the second exit and continue along Eastfield Road. You should see the Hilton hotel on your right as you approach another roundabout, take the first exit on the left onto Fairview Road. Keep going to the end and turn right at the T-junction, the car park is directly ahead.